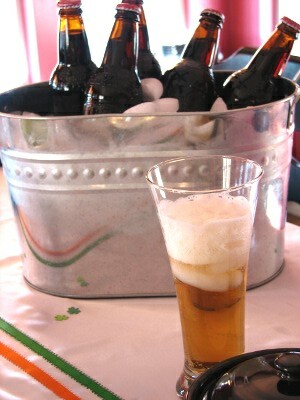 Cheers to St. Patty’s Day! This is a MUST celebration at our house! 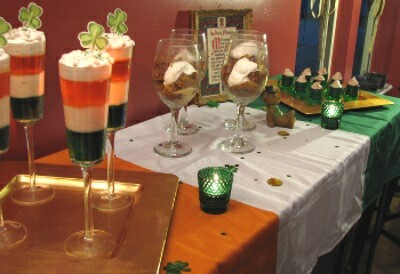 Every year we get to share a little bit of my husband’s Irish roots with family and friends. 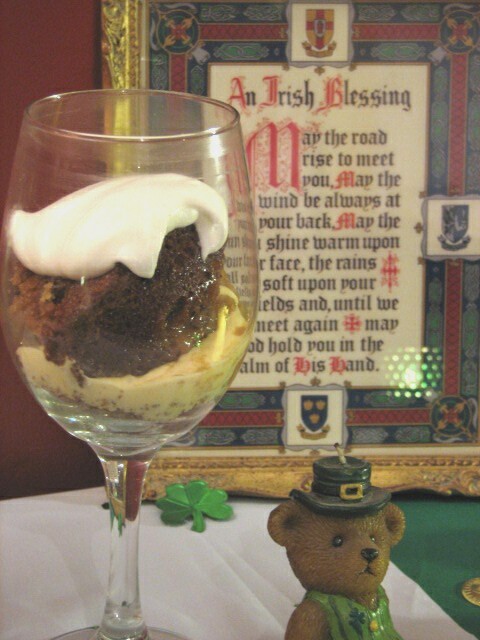 Corned Beef and cabbage fill the air, green is dispersed throughout the house, and glasses are raised to cheer some Irish luck and welcome the new beginnings of spring! So put on the Irish jig and be Irish for a day! Of course GREEN was the first thing that came to mind when deciding on how to design the table for dinner. My goal lately is to keep things simple, but sometimes (most often always) my battle with adventurous wins! 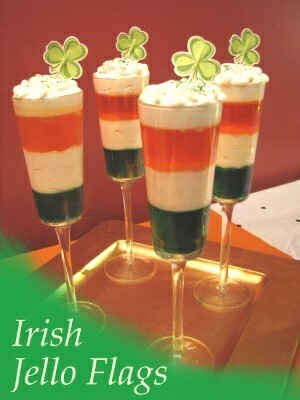 In this case, I chose to break the fun traditional ways of using ONLY green and use an Ireland flag as inspiration. Green, White and Orange became my theme colors! 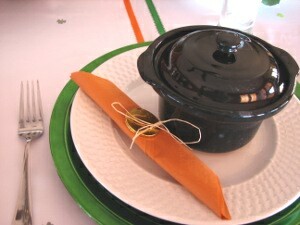 So on a simple white table cloth I placed strips of green and orange ribbon. 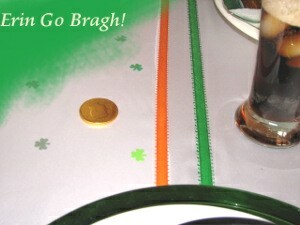 I sprinkled a few paper cutouts of shamrocks and gold foiled covered chocolate coins. Simple yet truly Irish! After Christmas I found a great deal on GREEN chargers. Perfect for this GREEN celebration! Once again I raided Heidi’s kitchen and used these black pots. 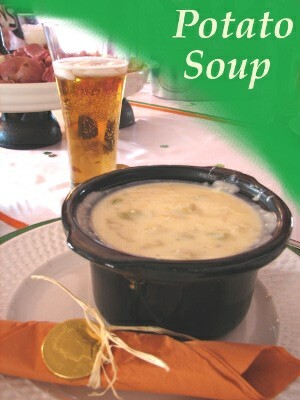 NO, they were not filled with gold, but definitely filled with a great must try potato soup recipe! Remember, your food itself can be the perfect centerpiece. It was for ours! Cooking corned beef takes a few hours, so make sure to start it early! Place corned beef in large pot covered with water. Add the spice packet that came with the corned beef and remember to add the juices from the packet as to add more flavor. Cover pot and bring to a boil, then reduce to a simmer. Simmer until tender. Add some quartered or whole red potatoes and carrots and cook until the vegetables are almost tender. Remove the meat and place in a platter to slice across the grain. Add cabbage to stock and cook for 10 – 15 more minutes. 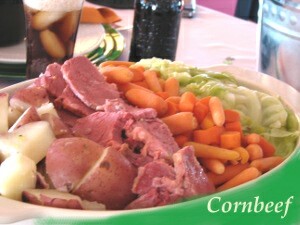 Place all vegetables along sliced meat and you have a traditional Irish meal! Combine the first 6 ingredients and boil until potatoes are tender. For the milk mixture, combine the milk, flour and salt. Add to the pot and return to a boil. Add the cheese by handfuls until melted. This is Heidi’s favorite Potato Soup recipe, seriously, it’s really good! 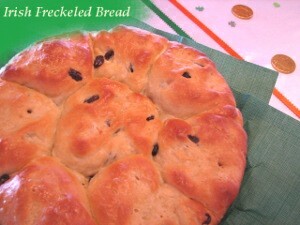 When looking online for a simple traditional Irish bread, I found this one! Andrea Meyers at andrearecipes.com made this recipe seem simple even for an inexperienced bread baker like me! I’m glad I tried it because it turned out awesome and very tasty. Thanks Andrea for sharing! so I brought out a couple of glasses and had some fun! These easy (but timely) desserts were a perfect fit for our theme! Make green jello according to package. Fill the bottom of glasses and let sit in refrigerator for 45 minutes or until set. To make the middle filling, use one package of lemon jello. Boil one cup of water and add lemon package until dissolved. Place in bowl in refrigerator for 25 minutes or until it has the consistency of an egg white. Add 1 8oz tub of whipped cream to the lemon jello and mix well. Add to set green jello. Once it is set, make the orange jello according to package and add as final layer! 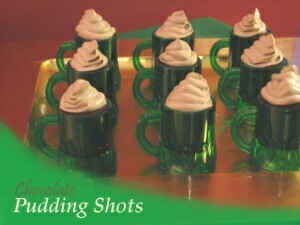 These green mini beer mugs were the perfect size for a rich chocolate pudding. Fill with your favorite chocolate pudding recipe and top with a swirl of chocolate whipped cream. Mix all together with a electric mixer until stiff peak forms! 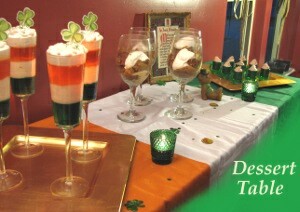 I wanted to keep with the traditional Irish theme so I Heidi and I created this! It was yummy! The cake recipe was found a while back, and unfortunately I can’t remember where I saw it, anyhow, whoever shared it – thanks for a great recipe! Preheat oven to 350 degrees. Grease a 2 quart baking dish and arrange sliced apples in bottom of dish. Sprinkle with lemon juice cinnamon and nutmeg. Set aside. Combine flour, brown sugar, baking powder and baking soda in a large bowl. Add milk, the 2 tablespoons melted butter and vanilla. Mix well and stir in nuts. Spread batter evenly over apple mixture. Combine the caramel topping, water and 1 tablespoon butter in a small saucepan. Bring to a boil. Pour the caramel mixture over the batter in the baking dish. Bake in preheated oven for 35 minutes or until set in center. Now this is the fun part! 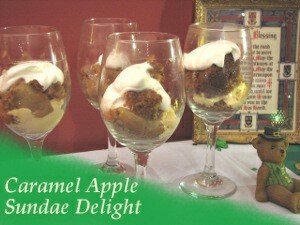 Spoon caramel apple mixture into dessert dish, inverting each portion. Add a scoop of ice cream then a little of the caramel mixture on top. You can repeat or add a spoonful of whipped cream. Best when served warm! So this time I DID NOT raid Heidi’s kitchen. 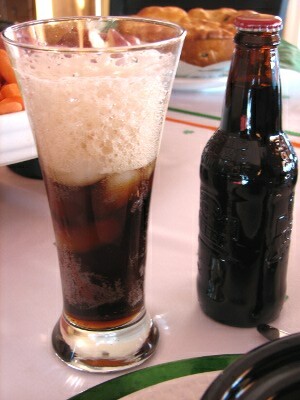 Instead I took a trip to the Dollar Store and found these fun glasses to serve our root BEER! Yes, only a $1.00! You should check it out sometime!